Both have a height of 93"/236cm after pushing each arch 12"/30cm into the ground. GF03A Camelot Arch 49"/124cm Opening with a Depth of 12"/30cm. 61"/155cm Opening with a depth of 18"/45cm. 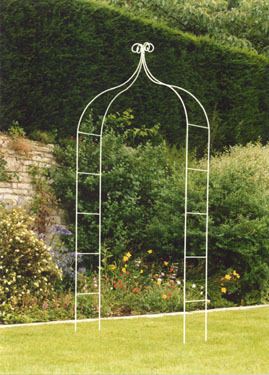 Two Camelot Garden Arches can be joined together with a top ring and side pieces to form an Arbour. Two Camelot Garden Arches can also be joined together either with a Crown or a Ring to form the Chelsea Gazebo or the Camelot Gazebo. For more details and information about our other Gazebos please click here. Two or more Camelot Garden Arches can be linked together to create the Camelot Tunnel or Walkway. For details of these and other Tunnels or Walkways click here. Westbury sub Mendip, Wells, Somerset, BA5 1EY England. To order: Post us a cheque (made out to Wessex Forge) for the full amount to us at Wessex Forge. Visitors are welcome at the Forge but we suggest you ring us before setting out. Prices quoted on this web site for the UK and for the EU include VAT. Special offers - we often have small quantities of products on Special Offer. These are usually products which have been on display at exhibitions. Over £500 the delivery charge is £46. There is an extra delivery charge for parts of Scotland, parts of Wales, Isle of Wight and Northern Ireland.